Going through any sort of legal document is a necessary evil for many people, in particular, for those who are just learning the ropes of starting a business. With Singapore being recognised in recent times as one of the fastest growing market for startups to grow and set up shop – so many ideas for the ambitious, bright sparks to brew and execute in one hand; and relatively limited amount of time in the other. Helping to lighten the load on businesses’ legal documentation processes – which can be mundane and time-consuming – LawCanvas provides just such a scintillating service. It is currently coming close to hitting the two thousandth mark in its usership, in just 7 months. Vulcan Post seeks to find out why startups are drawn like bees to honey, to the new app service buzzing in town. The app and web service simultaneously offers, and currently targets small businesses in Singapore. 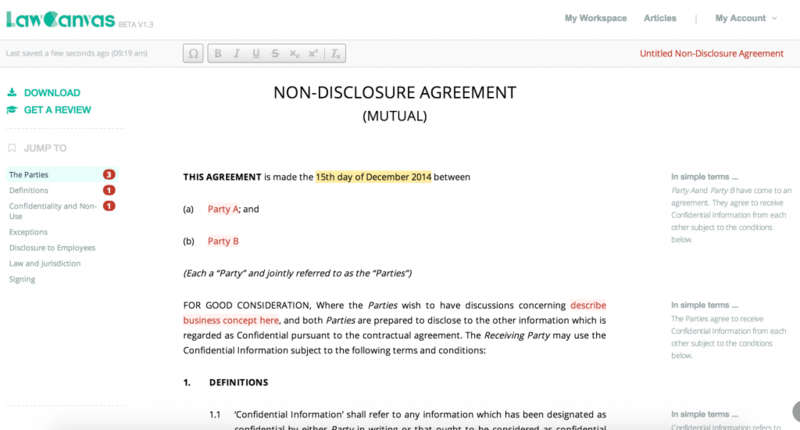 It features a collection of contract templates to peruse: templates such as the popularly essential “Non-Disclosure Agreements” and “Employee Agreements”; and other more weighty ones like “Founders Agreement”, “Website Terms of Services”, etc. LawCanvas comes with an in-built ‘smart editor’ to edit clauses to uniquely suit each user’s varied needs. The contents and services offered by the startup team are currently tightly complemented by its advisor, Chin Hooi Yen, a corporate law practitioner with over 14 years of experience; and is the founder and director of Polaris Law Corporation. Also read: Local Startup Founder Wins Ben & Jerry’s Competition, Gets Ice Cream Named After Them! “Most of our user base are all businesses, so it’s quite unlike your typical consumer app. Our traction so far indicates strong interest in what we’re building, and that we’re solving a very real problem for people,” shared Leong on the reception and feedback from their users so thus far, which seem to be made up mostly of other fellow startups. It is this problem-solving aspect of the app’s service which carries forth in the future expansion and development plans of the team into other countries’ market. LawCanvas’ journey has come quite a-ways from when co-founders Daniel Leong and Mark Png first had their brewing ideas to pitch to potential working partners. From pitching ideas to skeptical lawyers in the boardroom to standing on stage this year as a finalist and contending at the Tech in Asia’s Startup Arena competition, Vulcan Post got to know more from Leong about how they started and what plans they currently hotly have in the works. 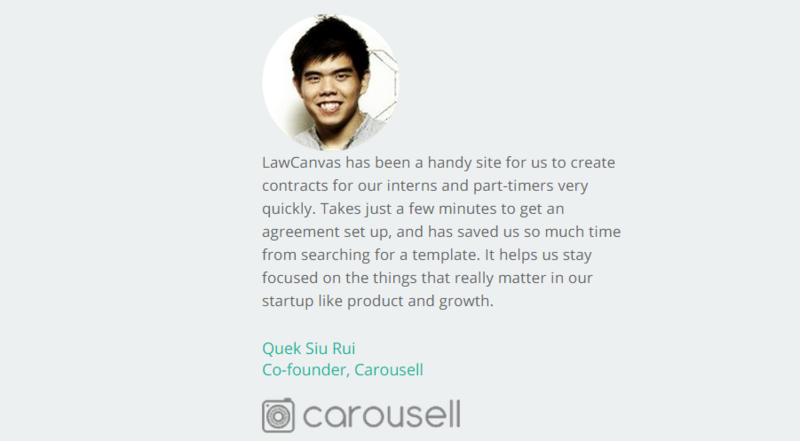 Give us the background on the development of the idea for LawCanvas. When I first started LawCanvas, I didn’t know anything about the industry so I spent 3 months reaching out to hundreds of law firms to try and get feedback from some of them. The very first meeting that I managed to secure was with the name partner of a mid-sized law firm. It was an utter disaster. I presented my idea to him, and he asked me if I had checked its compliance with the Legal Profession Act (it’s the most important piece of legislation for anything related to the legal industry). I hadn’t the slightest clue what it was! He was absolutely incredulous, and must have thought that I was mad for even trying this. It was really embarrassing. But he shared some tips on how to do my research and that was how I got started. We’ve come quite a long way since then and have made many friends in the industry. This has helped to cover a lot of the gaps in our industry knowledge. Being currently funded by Crystal Horse Investment, under the i.JAM scheme of the Singapore MDA (Media Development Authority) – how did that successfully happen? Michiel Wind and Chun Dong Chau of Crystal Horse Investments are good friends of the Founder Institute incubator in Singapore (run by Jeffrey Paine of Golden Gate Ventures), which I graduated from in 2013. Mark and I got to know them, and they really liked what we were building. Michiel and Chun have been incredibly helpful in advising us throughout our journey. Also, being recently recognised regionally at Tech in Asia’s Startup Arena competition (having made it through the finalist round), how does it feel to be recognised positively as such by the wider tech community? Firstly, it was very gratifying to be acknowledged for our efforts. But at the same time, being on that kind of stage helped us think through what it means to be a serious regional contender. In Jakarta (at the competition venue), we talked to a lot of people from across the region, and got a quick crash course on how to expand. The complexity of choosing which markets to expand to was made very clear, and the important thing is to not base the decision on market size alone. One has to understand the market dynamics in a particular country, and whether the intended audience there is likely to use your product given certain macroeconomic factors. Having said that, our findings were reassuring because that we found that the problem we’re solving exists in many other countries in the region as well. Critics would say the traditional route of drawing up legal papers is hiring a professional, a legal lawyer, to sort these matters out. Otherwise, the other way would be not making the information or process so easy to put together for the individual, (‘cutting and pasting’ for hours on end from various resources). Is your company aware of stepping on any toes, so to speak? We have a very mixed relationship with the legal profession. The lawyers that deal with technology and startups understand that we’re building something that helps people to help themselves. Other “old school” factions think that we’re “trying to practice law online” or even take business away from them – it really depends on their level of receptivity towards new ways of doing things. In a sense, what’s your company’s philosophy in creating such an app to helping the ‘greater good’ (small & easy startup entities)? 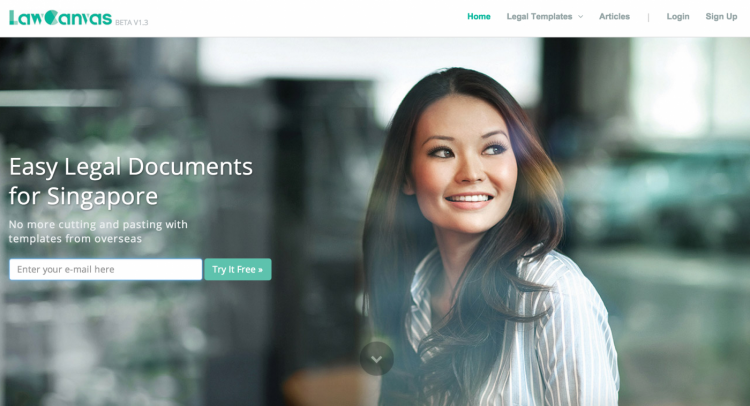 Helping small businesses produce legal documents is just the start. To take things one step further, LawCanvas is something that could help not just businesses but also the legal profession itself to produce documents in much more efficient ways. We’re helping to automate an area of law that has become very commoditised – i.e. the churning of basic documents – so that professionals can be freed up to perform more critical tasks like giving advice. What are the long-term plans and end goal for your company, any ideal model companies you’re looking to emulate? One proxy that people frequently link us to is LegalZoom in the United States. But we believe that the Asian market could evolve in different ways so it’s fallacious to blindly adapt western models wholesale. As with Alibaba, Jack Ma held back from adapting from eBay too closely because he understood that the Chinese market didn’t necessarily mimic the American one in terms of behaviour. There are always tweaks needed. To this end, we’ve been working on a new product we call “LawCanvas for Enterprise”. Some larger companies have found our software so useful that they want to use it for themselves internally to generate their own documents. 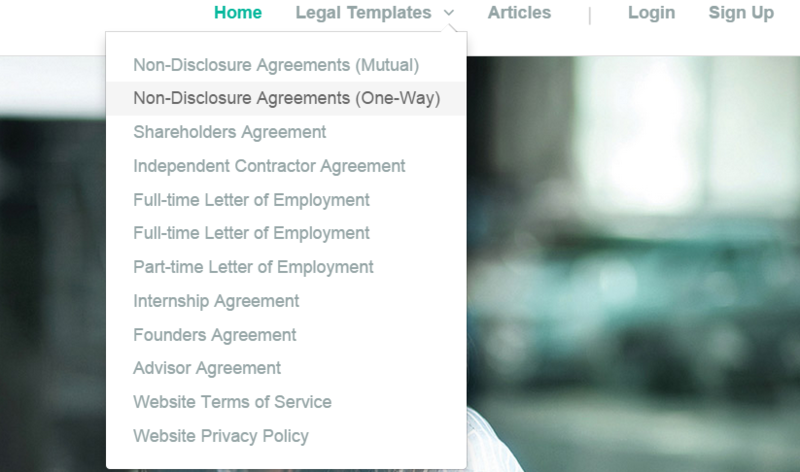 This is an enterprise product that we’re developing concurrently with our small business legal documents app. So if there are any companies out there that deal with huge amounts of standardised documents and want a better way to process them faster and with fewer errors, we’d definitely love to talk to them.